Fighter jets bombed at least three medical facilities in southern Syria overnight, a war monitor and local doctors said Wednesday, as forces loyal to President Bashar al-Assad appeared to ramp upa battle plan that has forced rebel-held areas across the country into submission. 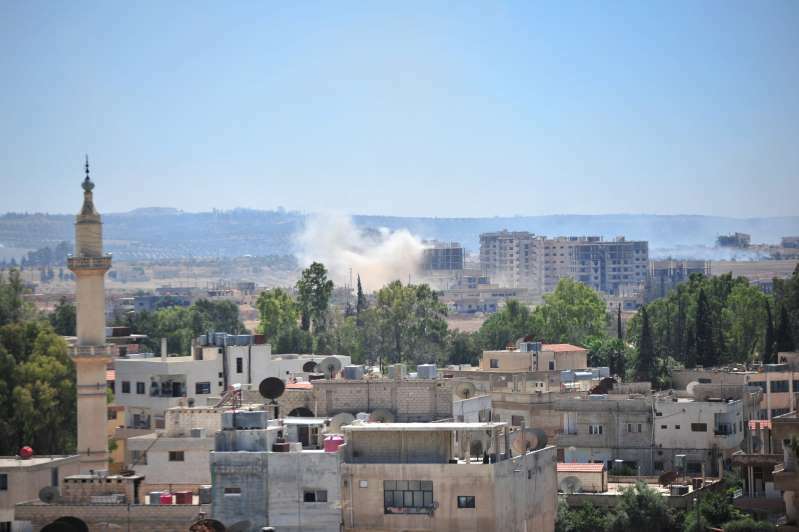 The Britain-based Syrian Observatory for Human Rights said the bombed hospitalswere near the Jordanian border in the towns of Saida, Jeeza and Musayfra. Aid groups have raised alarm in recent days as the government’s intensifying offensive has caused about 45,000 people to flee deeper into rebel-held territory, although Jordan insists it will not open its border to them. The Russian-backed offensive aims to recapture one of the final pockets of opposition-held territory in Syria. But its location along the Jordanian and Israeli borders has effectively turned it into a geopolitical tinderbox. and as pro-Assad forces deploy Iranian-backed militiamen alongside the Syrian army close to the Israeli frontier. minute solution to avert a broader war between Iran and Israel. Hospitals and medical personnel have routinely been targeted throughout Syria’s seven-year war, usually by government ­forces. The brutal tactic has often prevented residents from accessing treatment when bombs strike their neighborhoods. In some cases, the tactic has also hastened victory for Assad’s forces, driving up death tolls and putting rebel forces under greater pressure from the civilian populationsthat live among them. “Two of my nurses left when the bombing stopped last night. Their minds were collapsing,” said Abu Mohammed, a doctor from the town of Harak, about 25 miles northeast of Daraa. He said that their facility was badly damaged in an airstrike days earlier but that a handful of staff had stayed behind to dispense medicine to the wounded. “People are so scared here. They know the regime will pick them off one by one,” he said. On Wednesday, the International Committee of the Red Cross implored all sides to halt the fighting, repeating a call that has been routinely ignored by the warring parties through the protracted conflict. “We urgently call on all sides fighting in Daraa, Sweida and Quneitra to show restraint and to do their utmost to spare civilians,” said Robert Mardini, the organization’s regional director for the Near and Middle East, referring to major population centers across southwestern Syria. Video footage and photographs from the area showed residents packed into pickup trucks with blankets, food supplies and anything else they could carry. Aid workers said the locations to which the displaced are heading are already experiencing serious shortages of bread and fuel, with rent and food prices soaring. Journalist Maher al-Hariri, who said his house was bombed Monday, described how he had been pulled from the rubble, only to find no options left for medical treatment. “My family, my children are in great danger, and there is no way I can get them out,” he said. Reached by phone, Abu Mohammed, the doctor in Harak, pleaded for help, his voice shot through with panic.